Survivors of a suicide blast which killed 128 people as it ripped through a crowded Pakistani rally described scenes of panic and horror Saturday, as hospitals struggled to cope with scores of wounded. The attack in Mastung in southwestern Balochistan province on Friday, claimed by the Islamic State group, was one of the deadliest in Pakistan's history. More than 150 people were wounded when the suicide bomber detonated just as a local politician, Siraj Raisani, was standing to make a speech in a tent packed closely with supporters. He was among the dead. "As he stood up, there was a huge bang," said student Rustam Raisani, who was part of the security arrangements and was standing on the stage behind the politician. "I could not see anything. There were only dust and the smell of blood and burnt human flesh. I could hear voices screaming. "I tried to get up and I saw people who were trying to run towards the gate. They were trampling on dead bodies... Everybody was screaming." Raisani was speaking to AFP from the Civil Hospital in Quetta, where many of the survivors were taken. The hospital was overflowing Saturday, with so many people crammed into corridors and relatives of victims sleeping on floors and in corners that it was difficult to walk through the building. Witnesses and emergency workers have described seeing the injured piled into rickshaws in a desperate attempt to get them to hospital from the town, which has no electricity and little in the way of medical services. 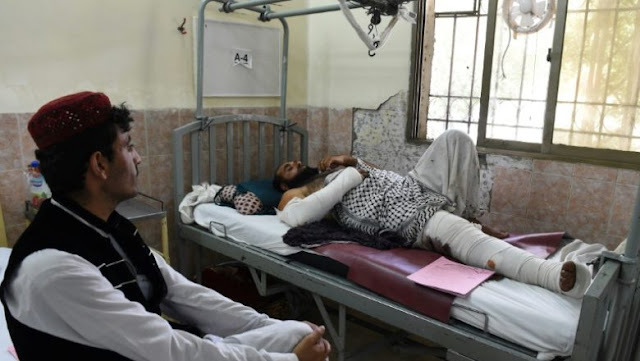 In the ringing moments after the blast, survivors began to rush towards the exit, said witness Ghulam Hussain, who also spoke to AFP from his hospital bed where he was being treated for head injuries. They were stepping on those on the floor, he saw. "It was a sort of stampede... I started to pull some of the people and scream for help." Luckily, he said, others from the crowd realised what he was doing and began to help him pull the wounded out of the rush. The blast, the deadliest in a series of attacks that have killed 154 people in Pakistan in the past week, has dented optimism after the militancy-wracked country has seen dramatic improvements in security in recent years. Analysts have predicted more violence ahead of an already-tense July 25 election, which pits the Pakistan Muslim League-Nawaz of former prime minister Nawaz Sharif and his brother Shahbaz against cricketer-turned-politician Imran Khan and his Pakistan Tehreek-e-Insaf. Smaller parties such as Raisani's local Baloch outfit are also contesting polls across the country, with activists calling on the military to provide greater security at campaign events. "(Raisani) had just begun when something hit me," Mansoor Ahmed, a 34-year-old activist with Raisani's party who also survived the blast, told AFP from his hospital bed. "I could hear very faint sounds of people screaming, and (there was) blood and human flesh. It was like a bad dream." Another man had fallen on him when the bomb went off, he said. "When I pushed (him away)... a fountain of blood spurted out of my stomach." After that, he says, he could not remember much. The doctors have told him that ball bearings, which were packed into the explosives, had torn into his stomach. Ahmed said he did not know if the dozen or so friends that he attended the rally with had lived. "The doctors said I will survive," he told AFP. "But I am not sure. Do you think I will survive?"